For many Irkutsk is nothing more than a transit point for Lake Baikal, but the city actually has a lot to offer on its own. On the banks of the Angara River lies the Siberian city of Irkutsk. The city was founded in 1661, pre-dating Petersburg by 42 years. At different times it was a merchant town that connected the trade routes between Russia and China, and in the 19th century the city became a site of political exile following the Decembrist uprising. Today Irkutsk is a major cultural, industrial and scientific hub and one of Siberia’s most popular tourist destinations. The best place to start exploring the city is the Lower Embankment, one of the most picturesque locations in Irkutsk. In its place there once stood a pier where ships going to the city via the Angara docked. The beautiful sight of the Angara from here is not to be missed, and the 18th century Orthodox church, Bogoyavlensky cathedral looming behind you creates a panorama of amazing views. Just a short footbridge crossing from the cathedral is the Victory Memorial. The memorial consists of two parts: a central pillar inscribed with the names of Soviet heroes who were Irkutsk natives, and the Eternal Flame. Next to its base is a platform for high school students—many Irkutsk schoolchildren perform in honor of the guard beside the Eternal Flame. On the plaza is the administrative building, know by locals as the Gray House. You can stroll for hours on Dekabrskie Sobytiya (December Events) Street, which is located near the riverbank. This is one of the oldest streets in the city; its name commemorates the battles that occurred here in December 1917 between the Red Guards and the counter-revolutionaries. This street contains two-story wooden buildings dating from the 19th century which were formerly occupied by families of Russian aristocrats—the princes Volkonsky, Golitsyn and Trubetskoy. From Dekabrskie Sobytiya Street, a simple turn leads to Karl Marx Street, the city’s main thoroughfare, with an excellent selection of restaurants. We recommend the Italian restaurant Prego, at 15a Karl Marx Street. Kick off the evening with a stop at Harat’s Pub, at 1 Oktyabrskaya Revolyutsiya (October Revolution) Street. At weekends the pub hosts concerts by local bands, darts tournaments, poetry slams, and many other activities. We also recommend the Megapolis and Izyum nightclubs (4 Ulaanbataar Street). Start the day at Monet café (42 Gagarin Street). As you sip your morning coffee, you can soak up the sight of the Gagarin embankment. On kilometer 47 of the Baikal Highway is the Taltsy museum of architecture and ethnography, the only collection of 17th-20th century architectural monuments.The museum is among the five largest open-air museums in Russia. It covers 67 hectares housing more than 40 monuments of architecture and wooden architecture from the life of 17th-century Siberian villages. The museum holds Christmas, Easter and Shrovetide celebrations. To get to the museum, take the bus from the station at 11 Oktyabrskaya Revolyutsiya Street or book a private tour at your hotel. The next stop is Listvyanka, home of the Shaman Rock, the symbol of Baikal. Opposite is a shopping area where you can sample hot smoked herring and Baikal fish as well as buy souvenirs. On the way back to Irkutsk, stop in at the Rassolnik restaurant for some traditional Russian cuisine. The chef will amaze you with borscht with prunes, salted fish and authentic Baikal tea with herbs. Its advisable to book ahead of time to avoid disappointment. 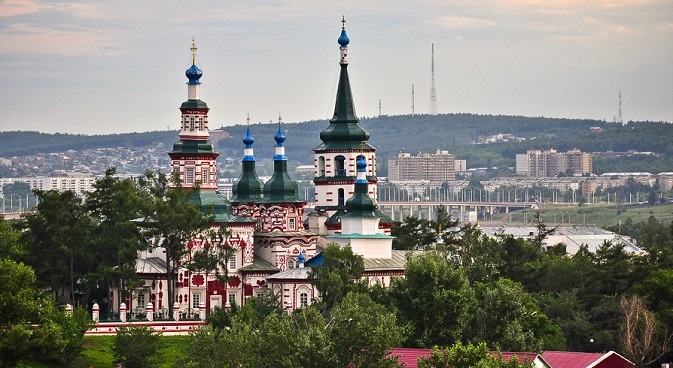 Irkutsk’s heritage has long been linked with the history of exile. When capital punishment was outlawed in 1753, the punishment method of “political death” was introduced. Convicts were deprived of all class and political privileges and were sent to a remote village in shame. They were often civil servants, aristocrats, politicians or government figures. They became torch bearers and held a major importance in region's history. The Irkutsk Regional Historic Memorial Decembrists’ Museum is located in the city’s historic center. It consists of two manors with commemorative buildings that were opened in 1970 and 1985 and are located on neighboring streets, S. P. Trubetskoy and S. G. Volkonsky. Inside the buildings’ historic interiors are displays of unique relics: genuine articles belonging to Decembrist families. The museum’s prize collection includes musical instruments that belonged to Maria Volkonskaya: the world’s only functioning pyramidal piano, dating from the late 18th century, and a rare music box that was manufactured in Switzerland in the mid-19th century. House museum tours take place every Saturday and Sunday at 1 and 3 p.m. For more information, call (3952) 53-62-58.